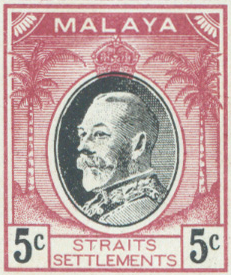 The genesis of the coconut definitive was triggered by the formation of the Malayan Postal Union in 1934, which required new stamps carrying the inscription MALAYA in Roman characters in accordance with Universal Postal Union regulations. The coconut definitives were among the very first stamps to herald a new era and foretell the future administrative unification of a culturally heterogeneous peninsula that would in turn kindle their astonishing diversification. 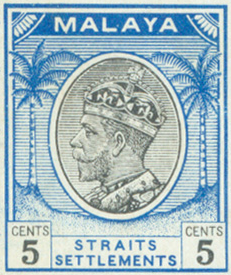 The design evolved from numerous essays prepared sometime between 1933 and 1935 by the Survey Department of the Federated Malay States and Straits Settlements in Kuala Lumpur. See Dewey (1963), Mekie (1977) and Norris (1985, 1988, 1995, 2003, 2010) for details. Norris Type V (Norris 2003), one of the seven subtle variations on the coconut theme, printed by zinc-plate photolithography (Wood 1948) on thin glazed paper, in a section of the Survey Department whose primary task was to reproduce maps (Norris 1985). The Straits Times (28 March 1934) said "the draftsmen of the photo-lithography section showed unsuspected ability in the, to them novel, work of making the line drawings". The portrait of the king follows a photograph by the Vandyk studio of London, which was also used in essays for Britain’s Silver Jubilee issue of 1935. But the king, himself a philatelic connoisseur, preferred the Nyasaland profile and chose it for the final designs. Indeed, West & Muir (1994) observe that there was a general disapproval of three-quarter portraits during George V's reign, profile heads being more acceptable. In the author’s opinion, the flamboyant, almost funky look of the Vandyk-based portrait in the coconut essays, exacerbated by the complicated but unsophisticated cross-contour rendering, matched neither the simplicity nor the cultural flavour of the rest of the design. 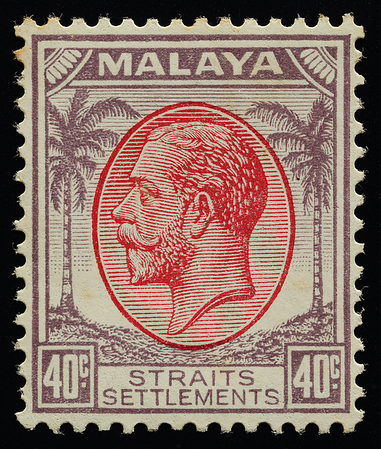 The typography of STRAITS SETTLEMENTS differs subtly from the issued version. Particularly noteworthy are the arched diagonal leg of the R, and the first E whose top horizontal stroke is shortened to accommodate closer letterspacing of ET. MALAYA, on the other hand, has yet to undergo its transformation from the thin and uniform metallic strokes seen here to the woodcrafted letters of timeless vintage. Two other essays. The one on the left is similar to Norris Type V shown earlier but has negative lettering at the top and solid black in the left half of the vignette background. The one on the right has a number of subtle differences. Although the exact method of printing is unclear, the design was probably transferred to the zinc plate via photographic projection on a light-sensitive coating on the plate. The areas of coating not cured by light were then washed away, followed by chemical etching of the exposed zinc in those areas (Norris 1985). The design could now be printed using an ink with differential adherence to the cured and etched areas. These ‘protostamps’, presented in some ten different colours, may have been meant to demonstrate the department's stamp-printing capabilities (Reeves 1988), or as a matter of expediency given spare manpower in the department during the Great Depression (Norris 1985). Security printers Thomas De La Rue were eventually invited to print the actual stamps while the Survey Department handled the rubber tokens used at the time to control the rubber supply (Cockburn 2017). The birthplace of the universal coconut duty plate. 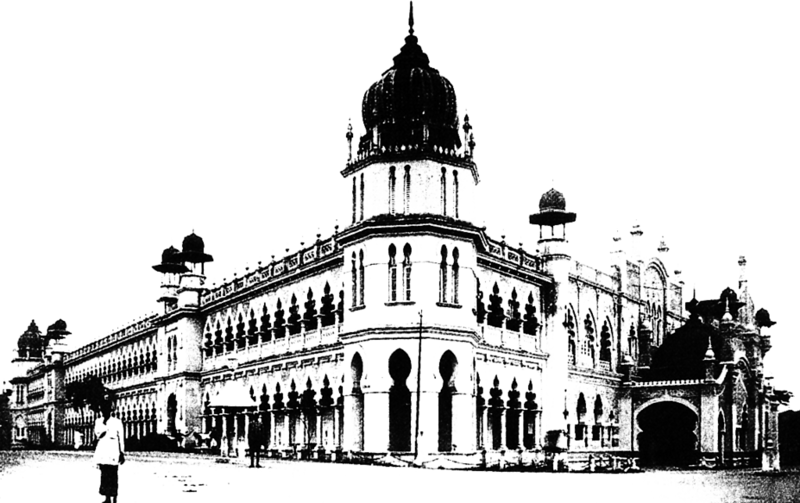 Survey Department in Kuala Lumpur, a Mughal-Gothic building constructed in 1910. Compared with the issued stamp, the essays look more cluttered, and the background shading fills the entire sky behind the palm trees from ground up, lacking the sunset lighting that would eventually impart the magical atmosphere to the issued stamp. De La Rue also made a subtle yet significant improvement: they increased the contrast between the coconut palms and the background, transforming the palms into architectural monuments. Some have commented to the author that the issued stamp is simpler and more 'enduring to the eye' than the essay. On the other hand, a fellow philatelist prefers the essays over the issued stamp, on account of the more three-dimensional look of the king in the former. See my comparative two-dimensional Fourier analysis. An interesting detail that De La Rue retained from the essays is the "fluctuating asymmetry" of the coconut palms, to borrow a concept from biology. Structures like human faces deviate slightly from perfect bilateral symmetry due to environmental factors, but retain their overall symmetry and attractiveness. Similarly, the palms in the coconut definitive are not perfect reflections of each other, having fronds in non-mirroring positions. The designer clearly favoured realism, and De La Rue took the hint. But it was also what De La Rue changed that would make the stamp "pop". While the essay depicted the king in a photographic style, De La Rue turned him into a sculpted relief. The two may look similar, but the legendary Arnold Machin explained the difference. When asked why he thought his Machin definitive (below) was so successful, he said it was because the queen's head was not a photograph but a relief. This, he said, made it a symbol and gave it a timeless quality (Myall 1999). De La Rue made other finishing touches that readied the stamp for debut on the world stage. In the production version of the coconut definitive, the medallion touches and indeed overlaps slightly with the rest of the graphic, perhaps to minimize the occurrence of white gaps, but leaving little room for misregistration. Furthermore, reduction of clutter in the design apparently took precedence over regal formalities, with the omission of the crown. 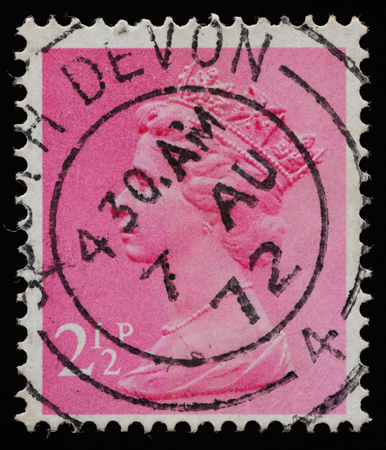 The coconut definitive is one of the very few stamps on which the British monarch goes crownless. The coconut definitive nearly went to the grave with King George V. When Edward VIII inherited the throne on the death of George V in 1936, photographic essays of new colonial definitive designs were prepared (Barker 1978a). Some colonies had lobbied to adapt their existing designs rather than adopt the new standardized design commissioned by the Colonial Office (Gunn 1983, 1989). The king agreed to this (Gunn 1983), but the Colonial Office eventually overruled it (Gunn 1989). In 2017, however, the author acquired on eBay a CMYK digital "replica" of what appeared to be a KEVIII essay based on the coconut definitive (below left). 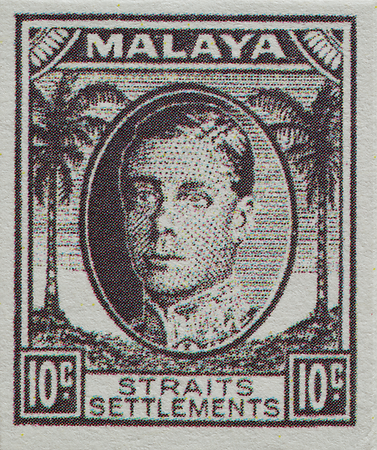 The face is shaded with the dashed lines characteristic of recess printing, instead of the continuous lines found in the actual letterpressed coconut definitives. Weirdly, the typeface in the denomination tablets is identical to that on the actual coconut definitives, except for the numeral 0. This 'essay' has never been reported. Fellow philatelists have suggested to me that it could have been the work of David Horry or Scott Visnjic. Horry (2001) published a collection of imaginary stamps that looked like real ones, including "stamps" of Edward VIII. Agence Coconut-Presse has contacted Horry for comment as of October 2018. Visnjic (Chen Chung Yuan), a Taiwanese artist, has stoked controversy in the philatelic community for his prolific output and marketing of "high-quality replicas". 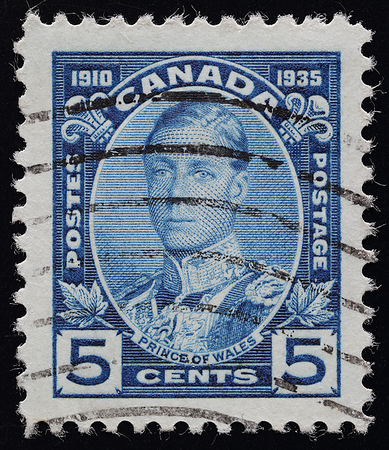 The portrait looks very similar to that on an actual stamp issued in Canada in 1935 (above right) when Edward VIII was the Prince of Wales. It was based on Bertram Park's studio photograph (below) of the prince in the uniform of the Seaforth Highlanders (Mackay 1997). When he became king, Edward VIII approved this portrait for new stamps. The portrait made it to colour trials for British stamps, but the king suddenly rejected it without giving a reason (Mackay 1997). The essays went missing, and Mackay (1997) chronicles in detail the chain of correspondence between Buckingham Palace and the post office as the latter tried desperately to trace them. It never found them. It isn't clear, however, whether any of the essays were of the colonies. There were 60 essays (Mackay 1997), quite a large number. Edward VIII was an adventurous maverick who wanted to serve on the front lines in World War I, but was prohibited from doing so for fear that he would be captured and used as a pawn. He was a University of Oxford dropout who disliked court protocol and befriended Adolf Hitler. 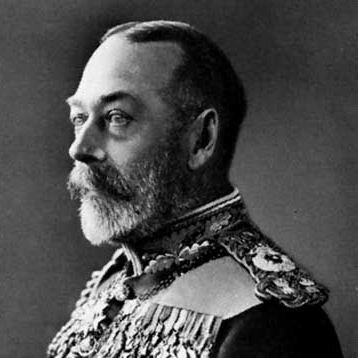 When George V died, he (Edward VIII) had all the clocks at home reset to the correct time; his father had had them 20 minutes fast (Mackay 1997). He decided to give up the throne so that he could marry the twice-divorced woman he loved. They remained married until his death. 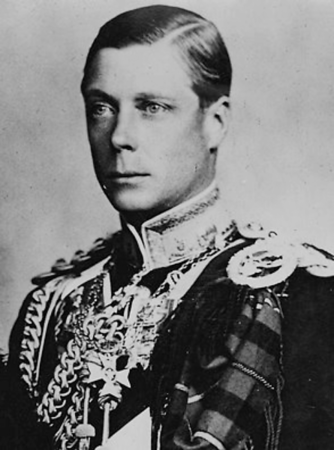 King Edward VIII abdicated on 11 December 1936. The Colonial Office ordered all KEVIII essays and stamps to be urgently destroyed, for fear of stoking a philatelic frenzy (Gunn 1983). Only a few escaped into the market. 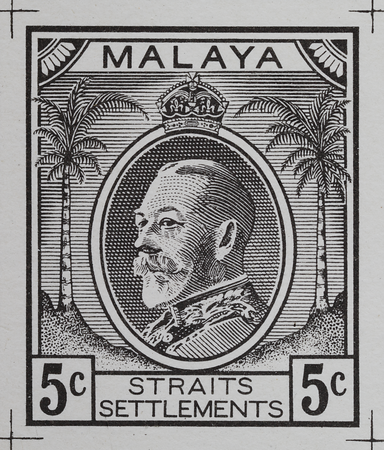 For some reason, the authorities fell back on the coconut design in the Straits Settlements for Edward's successor, George VI. Perhaps they got fed up with their new designs ending up in the trash can. The coconut definitive was saved. See the Malay states for post-war coconut essays.